Pausing in front of the cobbler shop, a colonial gentleman holds his mug. Click on the photo to see a larger version. I’ve been giving some thought to walking in the rain… with my camera! 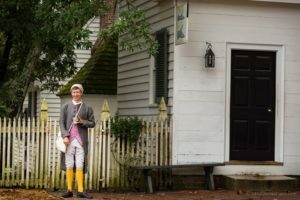 Tomorrow, I’ll be leading a Scott Kelby Worldwide Photo Walk in Colonial Williamsburg, VA. It’s my second year as the walk leader here. Last year, the day began with a torrential downpour… Most of the walkers braved the elements and were rewarded with a perfect morning. The rain stopped, but the clouds remained and created perfect lighting for portraits of the interpreters. Crowds were also slow to arrive, so we had lots of time to meet, interact and explore. 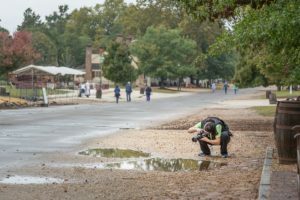 Jessie Fanning shoots reflections of Colonial Williamsburg.Click on the photo to see a larger version. admission to it’s art museums! Blue Talon Bistro is even offering half-priced Hurricanes… I have high hopes for a great walk! But why walk in the rain when you can wait for a sunny day? One reason is that you’ll see and record what most people miss! With less crowds! You can crouch down and shoot reflections. You can shoot flattering photos of people without using a diffuser. The dynamic range of your photos will be less, which will result in richer colors. 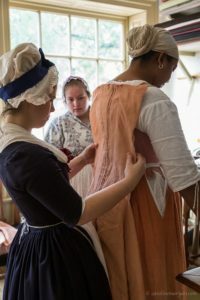 A seamstress fits a garment in the Milliner’s Shop in Colonial Williamsburg. Click on the photo to see a larger version. inside. Or go and enjoy an early lunch! A few years ago, I went on a Worldwide Photo Walk in Seoul, South Korea. It poured!!! We spent many minutes sheltering under the roof overhang of the National Museum, chatting about photography and living abroad. When the rain let up, the colors were rich and vibrant and the photo opportunities were fantastic! Here are a few shots from the Photo Walk in Seoul. It really is a photographer’s paradise! 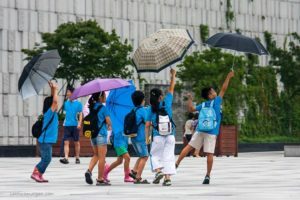 Wind catches the umbrellas of a group of Korean children at the National Museum. Click on the photo to see a larger version. 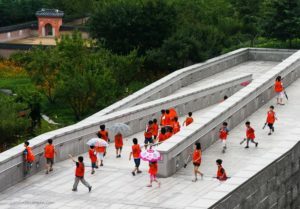 A group of Korean children happily moving down a ramp at the National Museum of Korea in Seoul. Click on the photo to see a larger version.